Of all the diamond instruments and analytical devices on the market today possibly the most valuable is the ASET (Angular Spectrum Evaluation Tool). 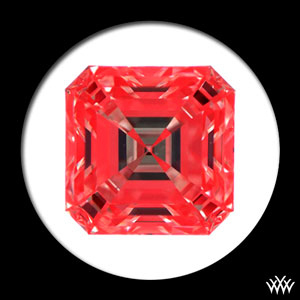 It is simple in concept, easy to use and to understand, and forms the graphical portion of the sophisticated light performance grading system used by the American Gem Society and its Laboratory. The cut quality analysis performed by the AGSL is widely considered to be the most comprehensive and critical of any lab in the world. Below is a case study of two high-quality Asscher Cut diamonds we recently brought in for a client. Both diamonds had grading reports from the GIA. In this article we look at the data on the GIA report, along with the Ideal Scope, ASET, and photographic images and Sarin measurements taken at Whiteflash. 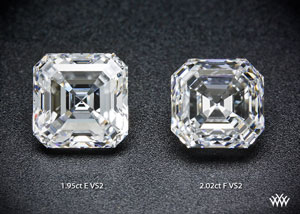 We compared a 1.95ct E VS2 and 2.02ct F VS2 (left to right- that’s right, the heavier stone is smaller!) The Ideal Scope images below of the two diamonds look pretty similar. The ASETs of the two stones on the other hand vividly demonstrate the difference between the two diamonds in terms of light performance. 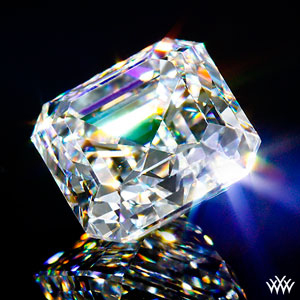 Because the Ideal Scope just reveals areas of the light return, leakage and obscuration, the two diamonds would appear to perform similarly. But ASET gives you more information. It tells you where the light is coming from that is returning to the eye. 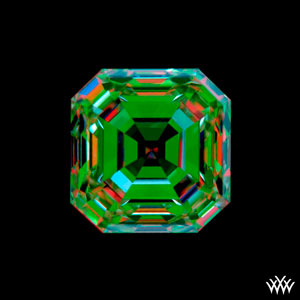 Light entering the diamond from lower angles appears in green (usually reflected off objects in the immediate environment). Light entering from higher angles (usually direct from the source) appears in red and is of higher intensity. 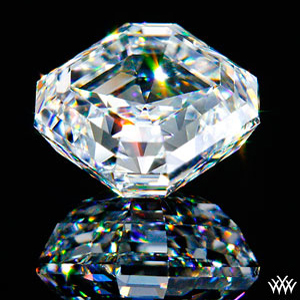 As seen in the side by side photo, (below) the two diamonds are very different in terms of brightness, which is quite predictable from the ASET and not from the Ideal Scope. Almost all of the light that returns to the eye from the 2.02 is entering the diamond from the sides, reflected off the surroundings, and is therefore much less bright. Another interesting thing is seen in the “glamour images.” The purpose of these images is to reveal the beauty of the diamond and the photographer works with the diamond until he gets an angle that is most becoming. While both are very pretty, notice how the photographer had to stage the 2.02 to shoot at a very low angle in order to reveal the personality of the stone. That is consistent with what we see in ASET. 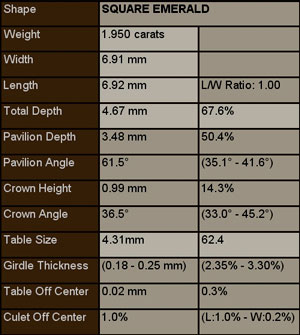 In comparing the diamonds from the limited data on the GIA reports, (below) very little can be gleaned in terms of the most critical value aspect – how the diamonds actually handle light. By studying the Sarin report numbers, (below) it is possible to see some differences that will result in performance differences, especially in the area of crown and pavilion measurements, but even experts would not be able to predict accurately the overall impact of those differences from the numbers alone. 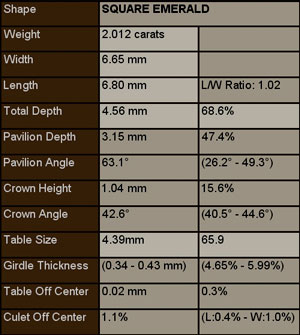 1) ASET is an excellent predictor of visual performance in diamonds. 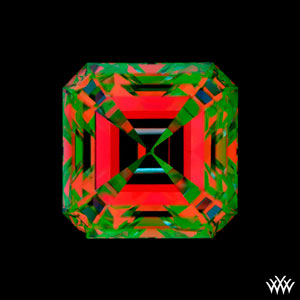 2) The GIA reports on these stones lack critical information needed to gain any true understanding of the light performance of the diamonds. 3) Comprehensive evaluation services, including ASET, Ideal Scope, Sarin data, and photographic images, are indispensable when shopping for diamonds. Consumers would be greatly benefited if all certified diamonds were presented with ASET images so that they could easily understand the light handling properties of the diamonds they are considering.